Side A1: The children Phrixus and Helle are rescued by the golden-fleeced ram Chrysomallus as they are about to be sacrificed to the gods by their father Athamas. 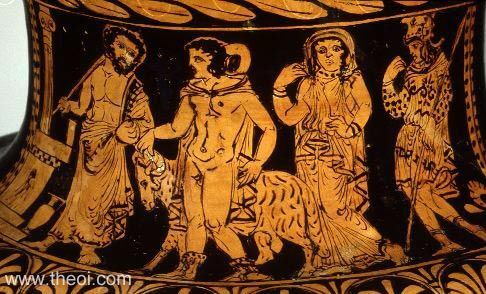 Alternatively, the painting might depict Phrixus sacrificing the golden-fleeced ram at Colchis accompanied by King Aeetes and his daughter Chalciope, the hero's bride. Side A2: The death of Actaeon (see other image). Side B: Orestes and the Erinyes (see other image).